I'm not at all into witches, goblins, monsters, blood, gore or ghosts....but I do think that "scary" houses are cool at Halloween time. I don't call them haunted, because, well, I don't believe in ghosts. But, scary...scary is fine at this time of year. 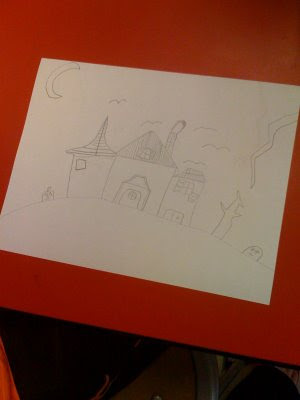 It's also a good opportunity to teach them about houses, and how to draw certain things (windows, doors, etc). 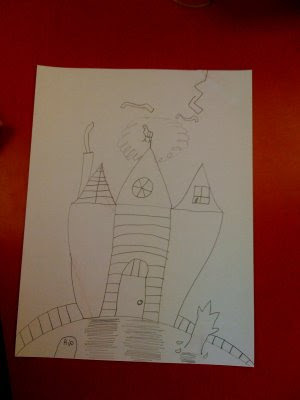 They had a fun time drawing crooked, broken, creeky, and old scary houses. Another example, of where I yet again...let the finished results slip past my doorway without snagging a picture or two.